While I try not to go too heavily into politics in this blog, sometimes it’s necessary to distance myself from people whose views might be confused with mine. A while ago I wrote about Cynthia Chase, a legislative loony who wants to make the state less attractive to people who value freedom. My point was that she’s of no great consequence and may even have provided some favorable publicity for the Free State Project. Some so-called libertarians have presented a petition calling for her impeachment. The January 25 House calendar mentions only “Petition from Darryl W. Perry of Keene and 119 others seeking censure and impeachment of a member of the General Court” without including the contents of the petition. The Free State Project has distanced itself from this action. Heather Dale has actually gotten the attention of a YouTube customer service representative in her effort to get paid as YouTube claims it will do. She has a new video about it. It’s clearly the result of snatching just a little time, and hopefully she’ll have a more complete story for us soon. She says that she got approval for one program but not for another; there aren’t any details. What’s still a serious concern is that it takes a big publicity campaign just to get the attention of a YouTube customer service representative. That’s a clear sign of a broken business operation. Google, like many successful businesses before it, has reached the stage of coasting on its success.I keep making attempts to use Google+ (which at least isn’t Facebook) but keep running into things that don’t work right. If it continues this way, it will be ripe for taking down. Although I don’t perform classical piano pieces publicly, aside from an occasional one at a filksing or convention, I like to play them for my own enjoyment. Currently I’m returning to Beethoven’s C minor Sonata, Opus 10, No. 1. C minor was a significant key for him; he used it for the later “Pathétique” Sonata, the Third Piano Concerto, and the Fifth Symphony. The first movement follows a pattern Beethoven liked, with a stern first theme and a lyrical second one. In the recapitulation he does some startling things with keys. After the first theme returns in C minor, the piece jumps straight into G-flat major, the remotest key possible. Then it goes to E-flat minor and finds its way to F minor, and the second theme alternates between F minor and F major instead of going back to C minor or C major the way a traditional sonata movement does. Only in the last 18 measures does it find its way back to C minor. The second movement is marked “Adagio molto,” and it had better be taken slowly, since there are passages in sixty-fourth-note triplets! I’m convinced Beethoven put those in just to make sure nobody would try to speed it up. That’s a part I’ve had to work a lot on. If I do it right, it sounds like a bit of glitter that isn’t too hard. A good performer would make it sound effortless. The third movement goes to the other extreme with a tempo marking of “Prestissimo.” I’m still working on that and not even approaching allegro yet. It has some bits with eighth-note triplets in one hand against sixteenths in the other; that’s actually easier to do fast. Just before the main theme returns, there’s a distinct foreshadowing of the Fifth Symphony’s opening theme. At the end there’s one more surprise, as the key slips up from C minor to D-flat major and the tempo slows down to a big arpeggio marked “adagio,” before the original tempo returns and the music fades out. I could buy and download a much better performance from Classics Online, but I wouldn’t have gotten as much out of the music if that’s all I did. Occasionally I’ve looked in on atheist forums on the Internet, but I’ve never stuck with any. The amount of hostility and mockery on them is just unpleasant. Whatever I think of religion, mocking it just isn’t worth very much of my time. One of them proved to be more an anti-Christian forum than anything else, with significantly more tolerance for any religion that wasn’t Christianity. Most of them have some good posts, but more are by people jumping on the most absurd actions of Christians or quasi-Christians. If you went by these forums, you’d think that the Westboro Baptist Church was one of the most important sources of religious thought today. The idea of a discussion forum on the basis of a common absence of belief is just odd, and it’s not surprising it doesn’t produce much that’s positive. As far as I’m concerned, the notion that there’s a being that created the whole universe and yet bothers with how we think and act is too bizarre to take seriously; let’s just move on. People who think there is one don’t injure me unless they try to force me to act according to their beliefs or pay for their propagation. If they do, that’s an issue of coercion, not of religion. Penn Jillette recently wrote: “Religion cannot and should not be replaced by atheism. Religion needs to go away and not be replaced by anything. Atheism is not a religion. It’s the absence of religion, and that’s a wonderful thing.” My reactions to his writing are very mixed, but in this case he’s on target. Reason is a positive and worth devoting time to; atheism isn’t. Thomas Jefferson said, “But it does me no injury for my neighbour to say there are twenty gods, or no god. It neither picks my pocket nor breaks my leg.” I think most atheists understand this, but the ones who are attracted to atheist forums are the ones who feel compelled to complain about religion. A discussion group centered on an absence really isn’t likely to have much to say. What would a “There is no Tooth Fairy” forum talk about? The current attempts to stoke fear and hatred of gun owners bear a strong resemblance to the ongoing efforts to convince us that we’re in constant, imminent danger from Muslims. The purpose is the same: to get us to accept more governmental intrusion into our lives. The effectiveness will be about the same. Biden’s “universal, total background checks” would have had absolutely no effect on Adam Lanza. One can argue whether or not he “stole” the guns he used, since they were his mother’s and were in the same household, but he didn’t buy them. More generally, people who are planning mass murder aren’t deterred by the legality of how they get their weapons. People who would legally defend themselves are the ones who are deterred. The New York Journal News ‘s stunt of publishing the names and addresses of gun owners provides an example of trying to draw hatred to a segment of the population, though in this case it backfired on them. I read a news story about a burglary that may have been facilitated by the list, though I can’t find the URL now; the burglar appeared to be going after the weapon in the home, though the attempt was unsuccessful. This attempt to stigmatize gun owners isn’t very different from the attacks on the so-called “Ground Zero Mosque” in New York. Find an “other,” stir up fear and hatred. It’s an old recipe. But such a requirement “represents a major change in the presumption of confidentiality that has been inherent in mental health treatment,” said Dr. Paul S. Appelbaum, the director of the Division of Law, Ethics, and Psychiatry at the Columbia University College of Physicians and Surgeons, who said the Legislature should hold hearings on possible consequences of the proposal. This legislation was pushed through without observing the Constitutional requirement for a three-day period between the introduction of a bill and its passage, on the grounds of an emergency situation that Cuomo invented out of thin air. Even the PATRIOT act took six weeks to ram through. By claiming this emergency, Cuomo added to the notion that everyone’s in imminent danger. Some Democrats have been uncomfortable about the country’s surveillance-state apparatus, which includes secret law and secret proceedings. The stirring up of gun hysteria may help to bring them into line. In any case, it’s clear that our leaders have lots of aces in reserve if the “War on Terror” runs out of steam. Freedom has become a meaningless buzzword. Americans are obsessed with the pursuit of the illusion of absolute safety from real and imagined threats, and all our leaders have to do is keep waving new bogeymen at us. 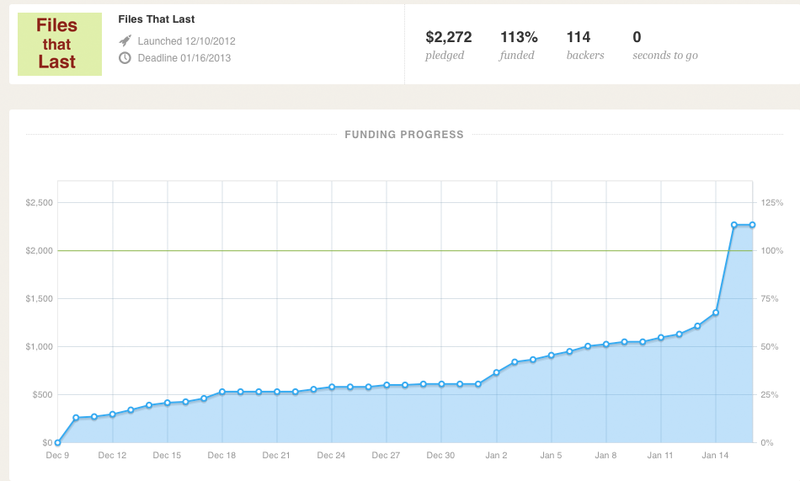 I’m still boggled at the success of the Files that Last Kickstarter campaign. Look at the screen shot below. The day before yesterday, no sane extrapolation would have predicted success. Now it’s a done thing. The push at the end came from multiple sources, in fact multiple countries. People in Holland, England, Canada, and the US were helping to promote it. Knowing I’m leaving people out, possibly some major sources, I need to thank Tom Smith, Mark Mandel, Wayne Borean, Paul Wheatley, Ben Deschamps, Harold Stein, Elfwreck, Johan van der Knijff, and the National Digital Stewardship Alliance. And everyone who contributed money or publicity. It’s just too long a list to mention everyone. The campaign amounts to 111 advance orders — 161 if you count the bulk student order which one person chose as a reward — which isn’t bad for a niche self-published e-book! This is my personal blog post about it, so it’s not about the details and what’s going to happen next — I’ve just committed myself to a lot more work — but about the sheer amazement at the way people came through. I’ve known what the filk support network is like, but didn’t think they’d necessarily be interested in a techie book. The digital preservation community has been great, and I’m looking forward to meeting some of you in person when I go to Personal Digital Archiving 2013 and the OPF Hackathon. Never underestimate the way your people will stand behind you if you give it your best effort! Posted in General. Tags: books, personal. Comments Off on Amazing! Heather Dale is an independent musician whom a lot of you know. YouTube has a program that pays musicians whose music is popular, but they claim Heather doesn’t own her own music, so they won’t pay her anything. I don’t know whether this is the way they treat less-than-famous musicians in general or she’s run up against some particular idiots, but spreading the word about this and similar cases might embarrass Google into doing the right thing. If you have any information that might be helpful, comment here or pass it along to Heather. Today I came across a Kickstarter campaign to produce a movie about “The Amazing Randi,” called An Honest Liar. As with any campaign, I did a little checking about its legitimacy. It gets a mention on the CSICOP website, which is a strong positive. Randi has done some excellent work to expose paranormal hoaxes, and I’ve made a pledge to the campaign. $148K is a lot of money, but I’m hoping they’ll reach the goal. Please consider supporting it and letting people know about it. The video is worth watching in any case. I learned things about him I hadn’t known before from it. This had me seriously scared, not because I believed that there was a problem so severe that it required shutting down all Java software, but because I thought Homeland Security had gone bonkers in a way that directly threatens the value of my professional skills. I’m a Java developer. If DHS is spreading bogus claims about Java, that hits me hard. These are serious concerns, and Java is being less and less used in browsers, so I can accept that the vulnerability is real. I’ve disabled Java in Firefox. But the large majority of Java in use today is server-side code in Web applications, and the alert doesn’t say anything to suggest that’s a problem. Following the distortions by CBS and ZNet would mean shutting down a lot of websites — to give an example I’m personally familiar with, Harvard’s entire online library presence. Let’s get a little technical for a moment. Java code can, in principle, do anything on a computer, including writing, reading, and deleting files. When you run an applet from a website in your browser, you clearly don’t want it able to do that, so Java provides a Security Manager that prevents it from doing harmful things. The bug which the alert talks about is in the Security Manager. When you’re running someone else’s Java on your computer, such as an applet on a website, that’s when you’re at risk. Web applications running Java need to talk to the file system, so they don’t use the Security Manager; they assume their code is trustworthy, and if it isn’t, that’s a people problem that could happen with any programming language. The stupid news reports will doubtless cause some panics in IT shops; I’ve had to deal with a couple like this in the past. In the end it probably won’t make much difference; the people who are technologically literate will figure out the difference, and the ones who aren’t will get jobs reporting on tech for ZDNet and CBS. But I wish they wouldn’t scare me like that. Update: I’ve seen a claim that this is a Windows-only problem. It isn’t. The alert says that Linux and Mac OS browsers are vulnerable. Some people in fandom are outraged by the notion that there can be a “fake geek girl.” I recently got into a discussion on this and decided to see where the issue had come from. The first hit in my web search was an article by Tara Tiger Brown from last March, which may be what sparked the objections, although I haven’t seen it (or any other substantive statement) mentioned by the people complaining. How do we separate the geeks from the muck? This does smack of fannish elitism to a certain point. The fear of others coming in and ruining what “we” have is a common one. Sometimes it’s justified, but sometimes it’s just fear of change. That article, though, apparently sparked some serious insecurities, both male and female. Women are afraid that they’re being regarded as the “muck,” perhaps that all women are (even though the charge is coming from a woman). Men are afraid that any interest which a woman shows them might just be because they have well-paying jobs and are part of an attention-getting culture. (I’m reminded of an episode of Bones in which the bidding at a con auction for a movie sword went up to half a million dollars. Somebody thinks we have money!) Sometimes both fears are true. The underlying premise here is that male geeks are so unattractive, indeed so collectively repulsive, that there is a 50% gap between what they will find attractive and the attractiveness standards of any given other human being. Fake feminism has found its way into the mix. It’s the old idea that all women are fragile and pure, dusted off and put into feminist language, even though it’s antithetical to actual respect for women. In this view, the notion that any women could be phonies is an attack on all women.The pedestal had its comforts, and some women want to get back up on it. Throw together male geek insecurity about women and female geek insecurity about being excluded from a male community, mix in a teapot, and you have a highly exothermic reaction.